Since I have cleared out my scan folder....Well technically, no - I just added two images, but those were PWEs I just received. They can wait. Anyway, since I cleared out my scan folder, I finally have a chance to start a new semi regular series here at 2x3 Heroes. Recently, I took one of the many extra binders I scored from my local Goodwill (99 cents for a 3" D ring, baby) and created a collection I call "hidden gems". In my world, hidden gems are the cards that are gorgeous in their own right, but not the iconic cards in the trading card world. 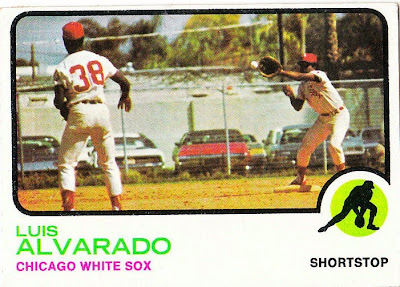 We all know of Gamble's afro, Luis Alvarado playing ball in a salvage yard, Munson in a cloud of dust at the plate and other fantastic rectangles over the years of cards. But there are others. Many others that are just part of a set and maybe because of the high volume of cards released or the change in attitude from set building to pulling the hit that they'ret forgotten. Hidden Gems is the binder for them. I will admit this is an idea based a lot on Night Owl's Cardboard Appreciation series. It was from reading his posts that I started to think about cards that don't fit my collecting habits but are still beautiful cards in their own rights. So in creating the binder, I was able to spend time going through my trade box to find those cards that I may have paused while sorting, thinking how great it looked though deciding it didn't fit my collection at the time. Now it does. However, I wanted to go a little farther in these series of posts. Placing a song at the end of my posts became my trademark gimmick. I started it on a lark years back, but decided that it would be an identity for my blog. Also, it gives me time to hunt my brain and YouTube for a video that suits my mindset. For hidden gems, however, the song is not a tie in to the post subject per se, nor a wink and a smirk in an attempt a humor. In regard to the songs in hidden gems, they are just that - songs you may never have heard from an artist, but should. Whether some early cut, live show or buried in am album release, these are great songs to my ears. Ok - I think I have set this up enough, let's see the card that really started this idea in my head. I actually had to ask Night Owl for a copy of this card (thank goodness he had dupes). I am so enamoured with this card I talked about it when it first came out and made a custom card from the image. The only fault I have is that the badging at the bottom covers the feet. But really, when the card is this beautiful, you can quickly overlook a small flaw like that. 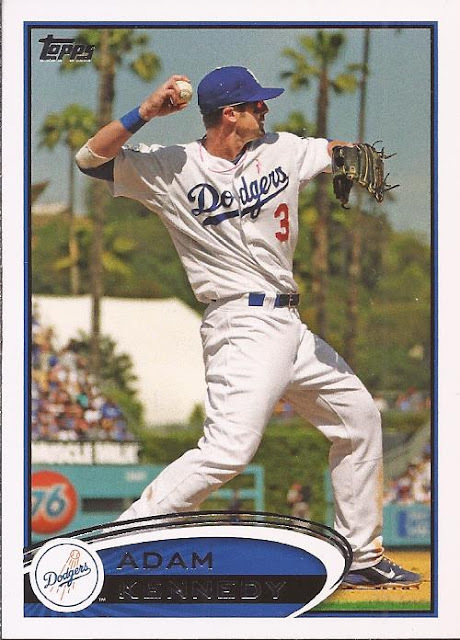 My hope is that the over blurred 2016 cards are a one year thing because Topps is forgetting that a card is not just the player, but the environment around him. The palm trees, the 76 logo, the Muscle Milk ad, the small bleachers, the blue sky - all those are as much of the image as the position of the player and the shadows and highlights on his uniform. The best photos pull you into the scene, not push part of it into your lap. For the first hidden gem song, this is a video that a coworker shared with me years back. When New York was the place and CBGBs was the club, a young band had a regular gig at the venue. That is 30 year old Debbie Harry on stage with Blondie about 2 years before the re-release of their first album in 1977 gained some success in Australia and notice from Rolling Stone. That lead to their break out success in 1978 with the album Parallel Lines and their first hit "Heart Of Glass". Lastly, Along with Radio 2x3, I have added the Hidden Gems songs to their own public playlist on the right side. That card reminds me of my playing days...specifically when I traveled to Clearwater for a college tournament. Such a beautiful background. Spring training is upon us!! I appreciate you incorporating a card I like with a concept that could have come from me with one of my favorite bands of all-time. Blondie is such an under-appreciated band, "Rip Her to Shreds" is probably my favorite track in their cataloge. Oh and I like this card concept quite a bit. If I had more restraint, I'd consider something like that myself. Awesome card...framed with palm trees! Glad to see a non-Dodger fan appreciate that card. Ordinarily, Adam Kennedy cards are tossers to me, but I love that card for all the reasons you do. What a beauty. Speaking of beauties,I was also in love with Debbie Harry. Back in the day my speakers were always blasting Blondie - and the Cars! yes, it is a nice card.